Don’t let the cover of this book fool you. 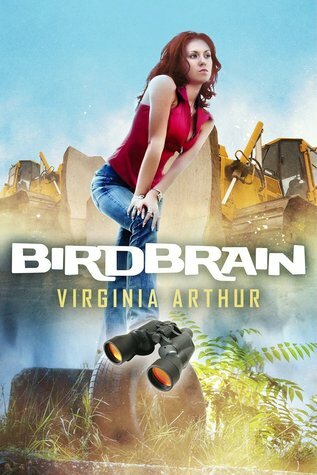 Not only does Birdbrain chronicle a young woman’s path to self-discovery, but it is also thought-provoking in regards to nature and the environment. Virginia Arthur took me on an emotional roller coaster. If you enjoy books that make you laugh, cry, analyze your beliefs, and reflect on relationships, then this one is for you. The first half focuses a lot on Ellie leaving her husband of six years. She goes back and forth with her decision, driving her best friend Patty crazy. There were times when even I became annoyed with her, but then it occurred to me that I have been in her shoes. In fact, I don’t know many women who haven’t had their hearts broken by emotionally stunted men. The indecision Ellie suffers from is so relatable, and her discussions with Patty about her ex reminded me of so many discussions I have had with friends. I could see myself in both Ellie’s and Patty’s shoes. Despite Ellie’s lingering sadness over the divorce, she is still an extremely endearing character. If reading about failed-relationship-induced heartache is not your cup of tea, don’t worry, there’s so much more to this book. Ellowyn’s inadvertent journey into the world of bird watching is another theme that will keep you entertained. It begins as something that helps her through the divorce and evolves into a fierce passion for nature. I loved reading about Ellie’s bird watching and about all the eco-related things in this book. In fact, it is doubtful that some of the ideas presented in this book will ever leave my mind or my heart. Note to readers: The author was kind enough to provide me with a complimentary copy of this book in exchange for an honest review. I am so glad to have read it. I may even take up bird watching.